Rainer Jenss and his family are two months into their around-the-world journey and they've just landed in Beijing, where they've found that they're both tourists and tourist attractions unto themselves. Follow along with the Jenss family by bookmarking their blog posts here. As we prepared to touch down in Beijing after a long day’s journey from Honolulu, I flipped through the in-flight magazine to the section with the airline route maps just to confirm that we were in fact going to be halfway around the world from our hometown when we landed. My rough calculation had us just east of the official marker, but close enough. I did this just in case a psychological boost was needed for Tyler and Stefan - if they started getting homesick or didn’t like Asia, I could easily tell them that from now on, we’d be traveling back towards home. (Even though that’s actually not completely accurate, it sounds good.) So much to my delight, after our first week in China, I don’t think I’ll need to pull this out anytime soon, for the boys are having a ball, thanks to some good fortune and surprises. As the day arrived for us to leave the U.S., it wasn’t hard to notice that the kids were a bit nervous and less enthusiastic than they had been leading up to our departure. Stefan had no inkling of what China would be like and Tyler was concerned about the language barrier. The layover in Tokyo, however, turned out to be a blessing, because it gave them a very good first impression of Asia via the cool Japanese products in the terminal shops (particularly the origami store). The sushi and noodle restaurant we sampled didn’t hurt either. When finally arriving in Beijing, we were greeted by a friend-of-a-friend whom I had only met via e-mail. She’s an ex-pat living in the suburbs who offered to put us up for as long as we wanted. Having two children of her own made it especially welcoming for the boys, and for Carol and I, we had a voice of experience that could familiarize us with China and help navigate the city. After two days of acclimation, we ventured out on our first excursion into China, hiring a guide to assist us in experiencing Inner Mongolia (an absolute must given the immense language barrier). We were particularly intrigued with the notion of sleeping in a yurt out in the wide-open grasslands – kind of like camping Chinese style. As expected, the boys got a kick out of it, but apparently, so do a lot of other Chinese tourists. Much to our surprise, big tour buses rolled en masse into this small "middle-of-nowhere" location two hours outside of Hohhot, the region’s capital. To our further amazement was the fact that of all the hundreds of other visitors, we were apparently the only Westerners – I mean only. Subsequently, we became as much of a tourist attraction as the Inner Mongolian countryside. This was also the case when we visited the outskirts of the Gobi desert. Our camel trek turned into a massive photo shoot, making us feel more like grand marshals waving in a parade than camel jockeys. Stefan, in particular, was in hot demand to get on film. One man even went so far as to kiss him square on the cheek. This fascination with blonde hair and blue/green eyes even carried over when we returned to Beijing. When we first arrived in the city, it didn’t take long to notice that there was a new game in town. It was remarkable to see that all the signage that must have supported the Olympic Games had now been replaced to showcase the Paralympic Games. The references were literally everywhere, including miles of banners and billboards all along the highways to and from the airport. We had not had a chance to watch too much of the Olympics themselves, but our boys were eager to check out the facilities where they were held, with the now famous Bird's Nest being the center of their fascination. As such, we secured general admission tickets to the track and field events, at a cost of only RMB 50 a piece (roughly $7.00). It's not an exaggeration when I say that our day at the Paralympics could possibly be the highlight of our trip so far. When we arrived at the Olympic Green on a bright sunny morning for the second day of competition, the kids were just bursting with excitement; the stadium was one of the coolest things they’d ever seen. Once inside, they become enthralled by the torch and fascinated with all the pageantry that ensued. But by far the most indelible memory of that day came from the incredible athletes we watched compete. There were shot putters, javelin throwers, and 400-meter racers with no legs. We watched men and women compete in the 200-meter dash without arms. But perhaps the most inspiring event was the 100-meter race. When we first looked at the competitors, we didn’t see any noticeable disabilities among the participants. Then we finally realized that all the runners were blind – watching in awe as some ran with guides, some without. 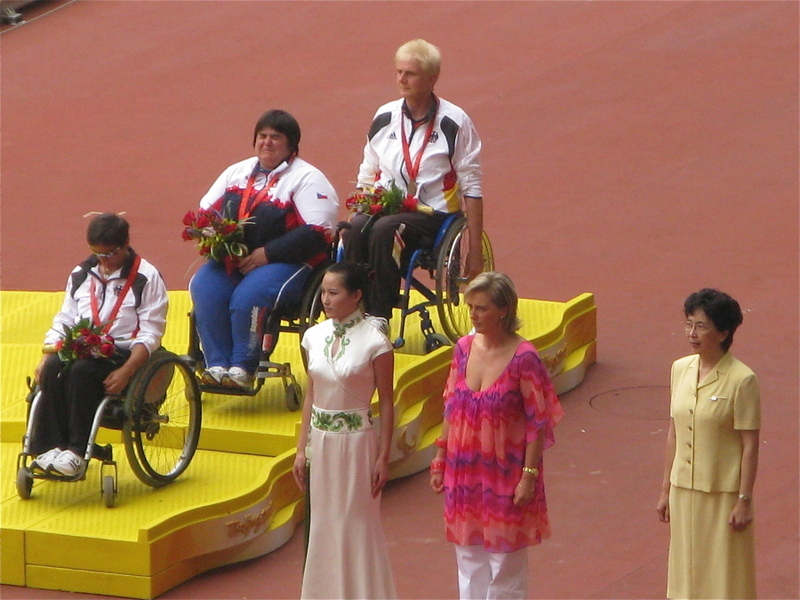 We were all further inspired watching the winners receive their medals on the podium in wheelchairs, particularly the Chinese female javelin gold medalist who received a thunderous ovation from the home crowd. And what a home crowd it was. Apparently, most of the tickets for the Paralympics were purchased by the Chinese people, who either couldn’t afford to go to the Olympics or just weren’t able to get tickets. 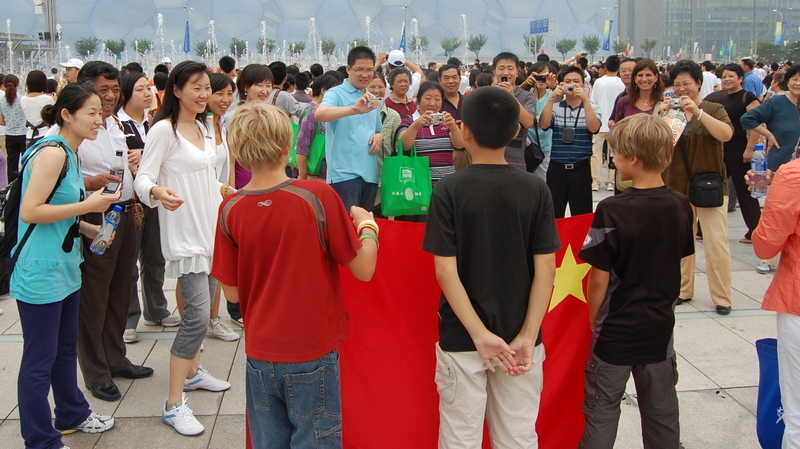 So when we left the stadium and headed to the Water Cube and other facilities, the kids were once again greeted by a horde of Chinese paparazzi. So whatever their motives may be for wanting their pictures taken with us, this experience serves as a good reminder in what makes traveling so special -- that despite all of the technology and access we now have to the world, there still seems to be a universal fascination with people that are different from ourselves. Whether it be physical or cultural, it makes us appreciate our humanity. I'm really enjoying these posts. Looking forward to Swaziland. My kids used to HATE that!! My blond-haired, blue-eyed twins lived in Ethiopia until they were four, then in Asia until they were seven. People came up all the time to touch their hair and stroke their faces. One of them tolerated it just fine, but the other one started hitting their hands away after a while. I couldn't blame him, but it just didn't seem polite somehow! I have been reading your boys' blog to my children and just stumbled upon yours! I think of your family often and glad that all of you are well and having the time of your life! We are moving into our new home this weekend! I wish that all we had were the bags you travel with!